The United States Congress is charged with the immense task of making our country's laws, using a system that can seem complex and confusing to the outsider. 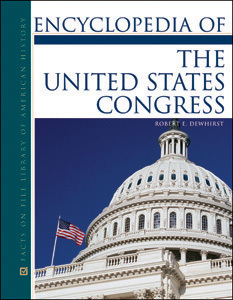 Encyclopedia of the United States Congress is an effort to inform the reader about the political process of Congress and how this institution has been a vital part of America's democratic experiment. Written by an expert on the topic, this comprehensive A-to-Z volume provides a thorough look at the United States Congress, including the people, events, and terms involved in the legislative branch of government. It also provides explanations of the relationships between the legislative and other branches of government, court cases, elections, political opponents, congressional leaders, scandals, controversial issues, and the inner workings of Congress. Thomas P. "Tip" O'Neill Jr.
"...recommended for public and undergraduate academic libraries." "This new work should be useful for students, general readers who’d like to know more about how Congress works, and newcomers to the Washington scene. Recommended for high-school, public, and undergraduate libraries." "The entries' comprehensiveness demonstrates the expertise and diligence of [the author]...their factual, well-balanced descriptions of controversial issues are commendable...will be a great addition...Recommended." "...users will find an intriguing mixture of people, entities, events, congressional and legislative terminology, and even pertinent court cases...for all public, school, and academic libraries."